The Wire was a landmark television show that aired alongside The Sopranos and Deadwood on HBO. Along with SciFi’s (now Syfy) Battlestar Galactica, it changed the way television shows work in the 21st century. Instead of a 26-episode season where main characters are killed off only when contracts expire or an actor moves on, seasons would last 10-13 episodes and major characters could die without warning. For The Wire, this was a function of its roots. Many of the writers and actors, including co-creator Ed Burns, were the same police and criminals depicted in the series. If you wrote or read crime fiction in the early-to-mid-2000s, you appreciated the show’s realism and unflinching look at the dark side of an American city. 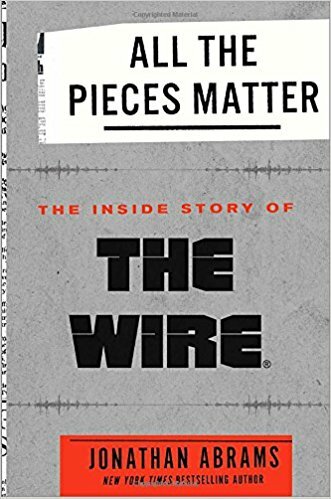 But the behind-the-scenes story behind The Wire is even more interesting. David Simon, who wrote the book that spawned Homicide: Life in the Streets and created The Corner and Oz, sold the idea of a “televized novel” about the war on drugs in Baltimore to HBO on the strength of the latter two shows. Simon and Ed Burns had worked together when Simon was a police reporter for The Baltimore Sun and Burns was a homicide detective. So the storyline of The Wire season 1 came from their days in the 1980s following a pair of drug lords who resembled the series’ Avon Barksdale and Stringer Bell. ﻿ But Jonathan Abrams doesn’t just tell the story through the writers, which included novelists Richard Price and George Pelecanos. He also brings in the actors, who have a different perspective than we normally see. For some, like Andre Royo, who played informant Bubbles, had to learn how to be a realistic addict as opposed to Hollywood’s tendency to use twitches and ticks you seldom see in real life. The most interesting actor to me was Clarke Peters, who played Lester Freamon. Peters bought a house in Baltimore for the run of the series and would board some of the cast. He had one rule. If you lived in his house, you had to attempt to do a painting. Freamon was a low-key, somewhat obsessed detective who passed time building miniature dollhouses. Peters lived a more Bohemian existence and is someone I wouldn’t mind hanging with for a day. But while many in Baltimore praised The Wire for featuring this oft-overlooked port city, some were not happy about it. Martin O’Malley, whose career was the model for Tommy Carcetti’s on the show, still derides the series as the worst thing that happened to his city. Mind you, we’ve already elected one thin-skinned idiot president. Not too sure I want another one. Stay home, Marty. No one likes a crybaby. Yet the show survived despite the odds and despite O’Malley’s misplaced rage toward it. During its run, it constantly faced cancellation. Seasons 4 and 5 almost did not happen. A sixth season dealing with immigration never materialized because the timing was wrong. But Simon got to tell his story his way. And now it’s considered a classic.